While the U.S. are relatively new to soccer, the team holds an unbeaten home record against Costa Rica since 1989. The most memorable of these victories was the "Snow Game" when the U.S. won against the frozen Latin American team by playing through a Colorado blizzard. But the U.S. shouldn’t be too complacent — the Costa Ricans were the victors in a friendly game in New Jersey less than a year ago. Costa Rica’s rise from soccer obscurity to soccer legend has been the stuff of fairy tales. The country had won the CONCACAF Cup in 1963, 1969 and 1989, but its World Cup appearances have brought Costa Rican soccer into the eyes of the world. Famously beating both Scotland and Sweden in Italy in the 1990 World Cup was a taste of success that wasn’t repeated again until 2014. Soccer fans were stunned to see tiny Costa Rica fight their way through the so-called "group of death" — Italy, Uruguay and England — in Brazil 2014. The team lost in a emotional quarter-final game, only going out on penalties to the Netherlands. Cristian Gamboa has an international career, playing in Norway and Denmark before signing with English Primer League Team, West Bromwich Albion. He’s fast on his feet and adaptable; playing either in attack or defense. Bryan Oviedo currently plays for English Primer League Team, Everton. His career as a versatile left field player is back on the track after a double leg break in 2014. 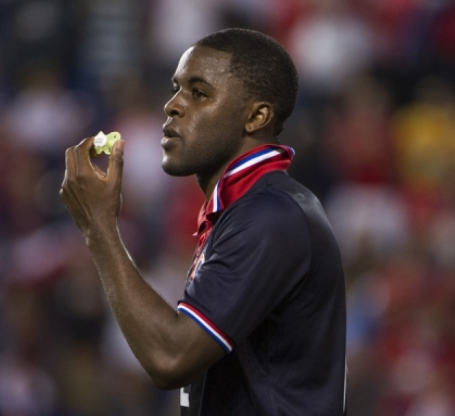 Joel Campbell in his second season playing for the Primer League team, Arsenal. The 23-year old already has 50 caps for playing for his national team, and is a strong, fast forward or midfielder. Bryan Ruiz left English Primer League team, Fulham to join Dutch team, PSV Eindhoven last season. Watch him closely for goal scoring ops! Keylor Navas will be very missed by his teammates in this game. The Real Madrid goalkeeper was largely responsible for the success of Costa Rica in the 2014 World Cup, and the U.S. can breathe a sigh of relief that he is out with an Achilles heel injury. Now all that’s left to do is get some bottles of Imperial on ice and settle down for the game!